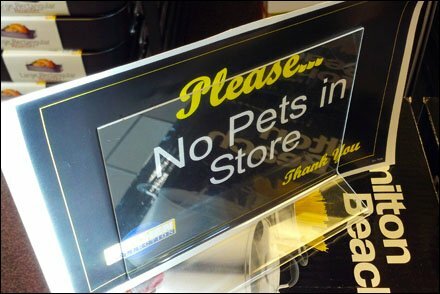 I rarely see “No Pets” signs, but I think most retailers discourage and few customers try to force the issue or make humans compete for aisle space with an animal on a leash. I sometimes have seen “Guide Dogs Only” permitted, but will have to locate an establishment posting that policy as a sign. 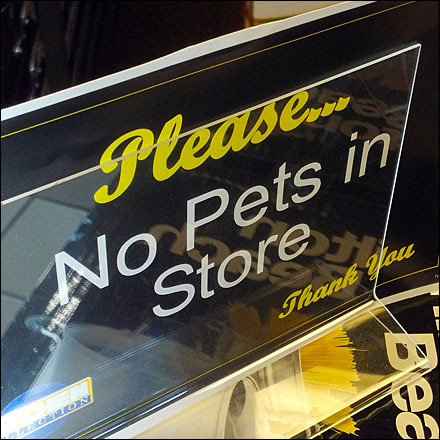 Meanwhile here is a “No Pets” disclaimer for a kitchenwares boutique. And I think I might agree. Animals are not a good match, even mentally, with food prep merchandise, ingredients, or hungry thoughts thereof. I have had pets I loved, but I would not ask you to accept them as I did. I am sure there are some who would disagree. Your contrasting pet opinions are welcome as comments below.